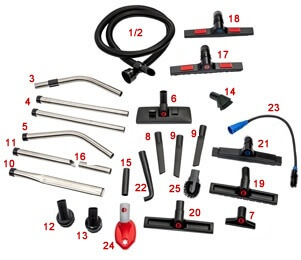 An excellent range of tools offering exceptional quality and versatility of function to suit the 32mm hose assembly. The range includes the items below. The items that can be selected here are highlighted (bold) in the list below. 32mm x 2.5m Anti Static Hose Assembly – Can be selected but not shown as a separate hose here. Please select the item that you require carefully. Price for each item will be shown when selected.